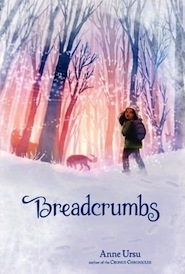 In Anne Ursu’s Breadcrumbs Minnesota is a magical place covered in glittery snow and shiny ice. You remember when winter used to be like that, don’t you? As I write this review in January there’s no snow to be found, and because I’ve read Breadcrumbs I’m convinced our usually snowy state is in the thrall of some sort of enchanted Heat Miser who abhors snow. It’s hard not to be enchanted by the fairy tale aspects of Breadcrumbs that mix so wonderfully with the mundane world. Here we have Hazel, an eleven-year-old girl, who doesn’t quite fit in. Her parents have recently divorced and her dad is a bit MIA, wrapped up in his new life. Hazel’s mom is struggling to provide Hazel with stability and implores her daughter to get her head in the game so to speak. See Hazel, and her best friend/next door neighbor Jack, are prone to delicious flights of fancy. Hazel’s imagination often gets the better of her and while she believes she should give up her babyish whimsical ideals, she doesn’t really want to. As she straddles that line between being a child and being an adolescent, Jack begins to grow colder and indifferent to Hazel. One day he disappears, allegedly to visit an aunt, but Hazel learns he’s been spirited away by the Snow Queen. Knowing her friend is in danger, Hazel sets out into the cold, snowy woods to save him. This is when the story really gets kicking. I know this a book meant for young kids, but come on, is there really anything better than enchanted woods? Even as an alleged grown-up, I was totally enthralled by all the fairy tale creatures and people Hazel meets on her search for the Snow Queen. Reading Breadcrumbs reminded me of all the things I really loved about reading fairy tales, there’s that definite you don’t know what’s going to happen nextness, and the whole nobody is who they appear to be. Folks, this is a good one. Don’t let the fact that it’s written for kids fool you. This book is beautiful, both to read and to look at. Ursu, to her credit, never “writes down” to the reader. The language here is spectacular, which is good because it does justice to Erin McQuire’s beautiful art. The beginning of Breadcrumbs where the stage is set and the real world is established was a little slow for me, but only because I knew that enchanted woods was coming and I couldn’t wait to get in there. The reward for getting there is well worth it. I loved it. I loved each character Hazel meets along the way more than the last. There’s one scene where Hazel meets a nice couple who want to protect her, feed her, and keep her safe. While resting in their home they keep talking about the garden, the garden, Hazel must see the garden. When Hazel does, it is amazing. I loved when the flowers begin to whisper to Hazel warnings about the couple. But what I love more, and most about the book, is throughout the journey Hazel learns to trust herself and her instincts.